Apple is running a new Holiday themed video, called “Share Your Gifts”. The short animated story features a girl who is often busy creating something on her Mac but who keeps all of her creations to herself, until eventually her dog releases the secretive creations into the world for others to enjoy. The video has been embedded below, along with a few other related videos, for easy viewing. The “Share Your Gifts” video is just under three minutes long, which makes it lengthy for a regular TV commercial, but presumably it fills the annual Holiday advertisement spot which Apple produces. 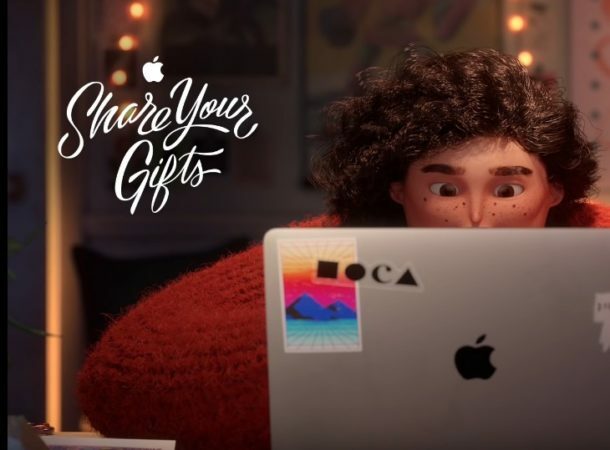 Apple has also posted a separate “Making of “Share Your Gifts”” video, which shows some of the behind-the-scenes work and process involved in making the Holiday ad. Apple has been running Holiday themed commercials every season for years going now, though the company seems to pull the ads from their YouTube page after some time making them difficult to find or re-watch much later, so enjoy the videos while you can. You can browse through other Apple commercials if the topic interests you. Awesome, thanks for these. Happy holidays! The only reason Apple released this lame ad was to promote their icloud services, which is as secure as an open window.